On Friday night at The Elizabeth Theater in downtown Detroit, the independent film festival “Streetlight Series” showcased some of the best local filmmakers. An enthusiastic crowd packed the downtown auditorium to witness a unique cinematic experience. 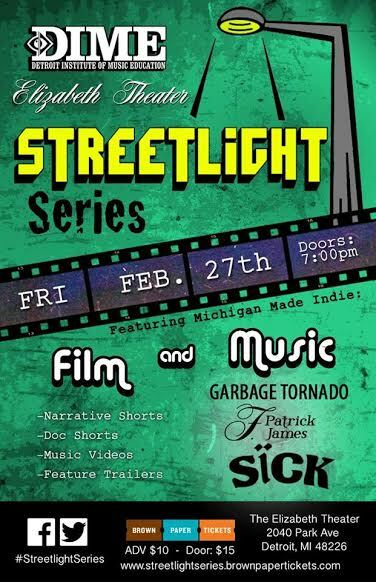 Streetlight Series screened narrative short films, documentary films, music videos, feature film trailers and commercial advertisements from artists around Michigan. In a state that isn’t known for its filmmakers, this local art-house movie festival was a surprising display of cinematic savvy. Some of the film trailers packed a political punch. One that caught my interest was the teaser for “Every Two Minutes,” a documentary produced by MSU students (Jenny Berggren, Nolly Dakroury, Carter Ellwood, Kirk Mason, Anna Myers, Ian Siporin, Logan Stark and Laura Swanson) about sexual assault in the U.S. The title comes from the haunting fact that there is a sexual assault in the United States every two minutes, while a third of women in the U.S. will experience it in their lifetime. Former Michigan Senate Democratic Leader Gretchen Whitmer is part of the many interviews in this powerful documentary. Apart from the subject matter being so vital, the trailer benefitted from an expert directorial and editorial touch. The teaser was so well-spliced that it was impossible to look away after the first 15 seconds. The black comedy “Body Politic” and the superstitious horror flick “The Seer” were a few of the narrative short films that impressed. Both were chilling but delightful in their own right. One of the most surprising elements was the cinematographic quality of these films. Independent movies (especially from outside of Hollywood) tend to have poor production value. This wasn’t the case for this series of shorts. With easier access to professional video/sound editing programs and high definition cameras, it’s much easier to make a low-budget flick than it was 30 years ago. This was also evident in the music videos for “She’s a Monsta’” by J Money The Takeova and “White Snow” by Alexa Lusader. Although I detested the melodies for these songs, the videos were undeniably well-shot. Sometimes, that’s all you need for a mediocre song to become a hit. Live music followed the film portion of Streetlight Series. Sick, Garbage Tornado and F. Patrick James performed for the crowd of The Elizabeth Theater. Although, they would’ve greatly benefitted from better acoustics. The awkwardly shaped room swallowed the audio quality. The Elizabeth Theater is upstairs from the popular downtown pub, “The Park Bar.” Placed near Cliff Belles, The Fox Theatre and Comerica Park, it seems that it gets a fair share of customers. It’s well known for being a part of The Detroit Shakespeare Festival and also hosting live plays, Burlesque and comedy shows. See what they have in store by visiting their website. Also, keep an eye out for these metro Detroit-produced films. One of them may make their way to the national spotlight soon. Eric Kiska graduated from Northern Michigan with a BS in English and writing and minor in art and design. He’s also a former video editor at Detroit Public TV.